Town in Bohemia; famous for its mineral springs; first made popular by the emperor Charles IV. in 1350. When King Ladislaus II. confirmed, in 1499, the privilege granted to the town by Charles IV., he added, "as an especial favor," that no Jew should be allowed to settle there; this feature in the privilege remained in force until 1793, when the emperor Francis II. enjoined the city to obey the general laws of the country in its attitude toward the Jews; the city, however, paid little attention to this new decree. The "Patent" of Feb. 18, 1860, removed most of the Jews' disabilities. The records and documents of the town give ample evidence of the rigor with which it opposed the settling of the Jews within its walls. The neighboring Jews of Lichtenstadt especially made many futile efforts to enter. 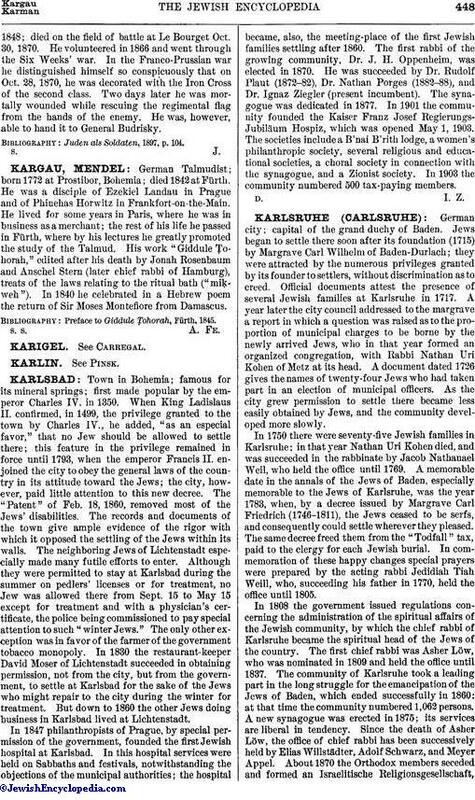 Although they were permitted to stay at Karlsbad during the summer on pedlers' licenses or for treatment, no Jew was allowed there from Sept. 15 to May 15 except for treatment and with a physician's certificate, the police being commissioned to pay special attention to such "winter Jews." The only other exception was in favor of the farmer of the government tobacco monopoly. In 1830 the restaurant-keeper David Moser of Lichtenstadt succeeded in obtaining permission, not from the city, but from the government, to settle at Karlsbad for the sake of the Jews who might repair to the city during the winter for treatment. But down to 1860 the other Jews doing business in Karlsbad lived at Lichtenstadt. In 1847 philanthropists of Prague, by special permission of the government, founded the first Jewish hospital at Karlsbad. In this hospital services were held on Sabbaths and festivals, notwithstanding the objections of the municipal authorities; the hospital became, also, the meeting-place of the first Jewish families settling after 1860. The first rabbi of the growing community, Dr. J. H. Oppenheim, was elected in 1870. He was succeeded by Dr. Rudolf Plaut (1872-82), Dr. Nathan Porges (1882-88), and Dr. Ignaz Ziegler (present incumbent). The synagogue was dedicated in 1877. In 1901 the community founded the Kaiser Franz Josef Regierungs-Jubiläum Hospiz, which was opened May 1, 1903. The societies include a B'nai B'rith lodge, a women's philanthropic society, several religious and educational societies, a choral society in connection with the synagogue, and a Zionist society. In 1903 the community numbered 500 tax-paying members.